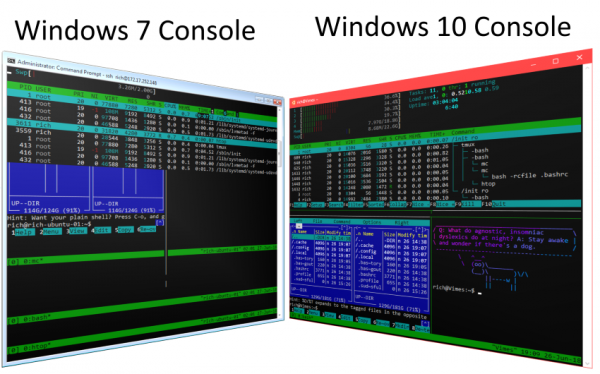 One of the sore points of the Windows command-line environment is that the command-line windows themselves, the "console" windows, have always been a bit strange. But command-line windows didn't get the theme; they had a regular Windows title bar and borders. That's because the console windows were "special." Over the last few years, Microsoft has been working to improve the Windows console. While there are third-party efforts to do the same on Windows (with programs such as ConEmu), they all tend to be quite limited: they work by creating a Windows console window, hiding it somewhere off-screen, and scraping the characters from that console window.